As just mentioned the Windows version used IIS to host the website part of the Web Interface. IIS needs be enabled with ASP.Net. Also Visual J# needs to be installed on the system. Also Citrix wants the Citrix Access Suite console installed on the Web Interface. 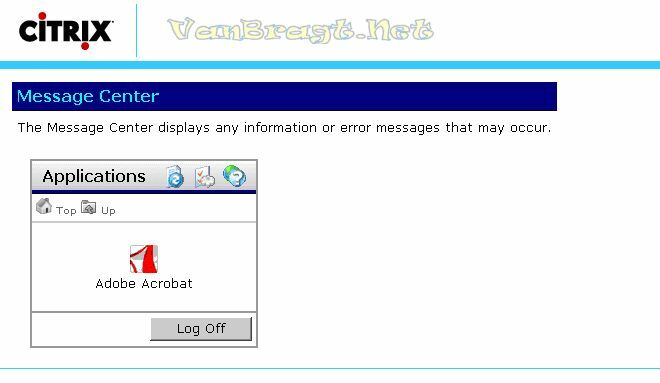 The necessity is not clear to me, but I think otherwise some people do not know how to configure the Web Interface. If you install Web Interface 4.2 you need to install patch ASC400W004 for the Access Suite Console. The installation itself is pretty forwarded and as almost every Citrix product well documented. First you need to choose the language you would like to install (beside English, German, French, Spanish or Japanese), followed by the acceptations of the license agreement and the installation directory. New in Web Interface 4 is to store the configuration on a central location. If you choose this option the configuration is stored in the Datastore of Citrix Presentation Server. The old way with the webinterface.conf and config.xml (for the PNAgent) is also still available. You need to specify this the first time the Web Interface system is discovered by the Citrix Access Suite console. Citrix delivers parameters with the installation to install Web Interface unattended for both the local configuration and central configuration. I wrote a article about the unattended possibilities which can be found (shortly) at MSTerminalServices.org. 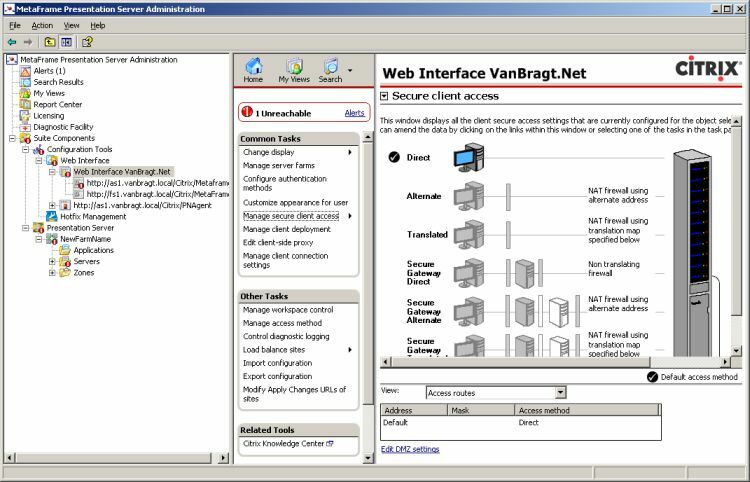 In earlier versions of Web Interface a Admin Website was available for configuration purposes. With version 4 the configuration component is added to the Access Suite Console. The configuration possibilities are comparable with those in Web Interface 3. The same good options like limiting domain names, showing the domain name, smart card support and the possibility to configure different access methods. However configuration is now wizard driven, which makes configuration easier because you only see the options which are available. Also the graphical view for the client access part is nicely done. Also the Workspace control and Client Connection settings can be configured easier and more in detail. If you would like you can give users the ability to change lots of settings so they can create their own Web Interface view and configuration. Web Interface 4 also supports PDA configuration (in combination with Presentation Server 4 of course). If you would like you can secure traffic between the Presentation Server Farm and the Web Interface using SSL. Also the STA functionality is moved to the Presentation Server, in earlier versions this component runs on a (IIS) web server. Also the configuration for the PN Agent is a still similar like the Web Interface. PN Agent automatically arranges shortcuts of the applications in the Start Menu and/or Desktop of the user. Remember that the placement of the icons can be arranged through the PN Agent client itself, configuration at the Published Application within the Citrix Management Console and within the Web Interface. Within the PNAgent configuration in the Web Interface you can hide the options so users can not make adjustment to the client itself. As mentioned before Web Interface now supports a central stored configuration. You can define a group where you can add sites to it. These sites automatically gets the settings as configured for that group. You can also import and export a configuration. The files are exactly the same as in the location configuration (in other words you get a file called webinterface.conf or config.xml). One of the complaints of Web Interface 3 was the support of multi languages. Web Interface 4 support now more languages within one Web Interface. Citrix delivers standard English, French, Spanish and Japanese with Web Interface 4. It is not difficult (anymore) to create your own first language and add this one to the Web Interface. The community has already created for several languages complete language files. Take a look at BrianMadden.com where (at the moment of writing) six languages are already available. Within the configuration you can change the basic appearance of the Web Interface, but some administrators needs more customization or modifications. Very good resources are Thomas Koetzing and Jason Conger. I still thinks that WI is a wonderful addition to Citrix Presentation Server with no extra costs (Except only hardware and OS). With Web Interface 4 central configuration is getting one stop further with the central configuration store. With the addition of multi language support Citrix acts on much request out of the community. In combination with the Access Gateway or Citrix Secure Gateway is a wonderful solution to provide access to the application via the Internet. It looks like Citrix want to move us to Web Interface and/or the PN Agent, because new features like Workspace control are only available for these two items and not for the traditional Program Neighborhood.